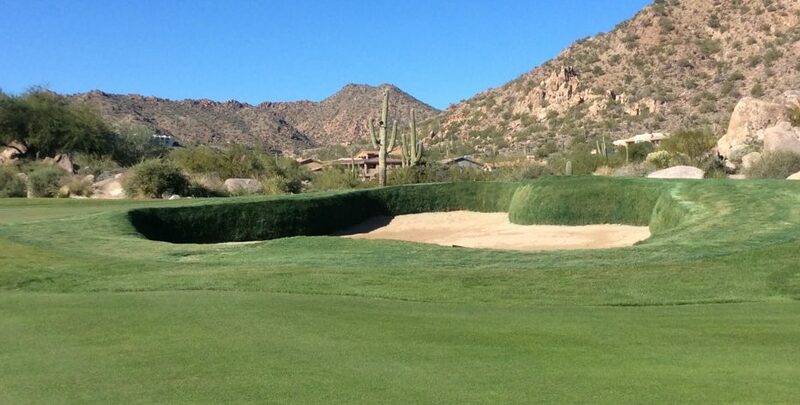 FOUNTAIN HILLS, AZ (DEC. 20, 2018) – When Pro Turf International Principal Kip Wolfe first heard golf course owner Don Misheff’s idea for bunkering at SunRidge Canyon Golf Club, his initial reaction was a scratch of the head. “He came to us with his vision of adding sod walls to his bunkers, and my first thought was, “You do realize you are smack dab in the middle of the desert?” said Wolfe. “Don showed Ron and I pictures of the style and look he was wanting. Don has always been an outside-the-box thinker, and he convinced us that this could work. Misheff, an Ohio resident who purchased the course in 2010, knew his idea would raise some eyebrows. But he also believed it could work, and would enhance the playing experience for his golfers. 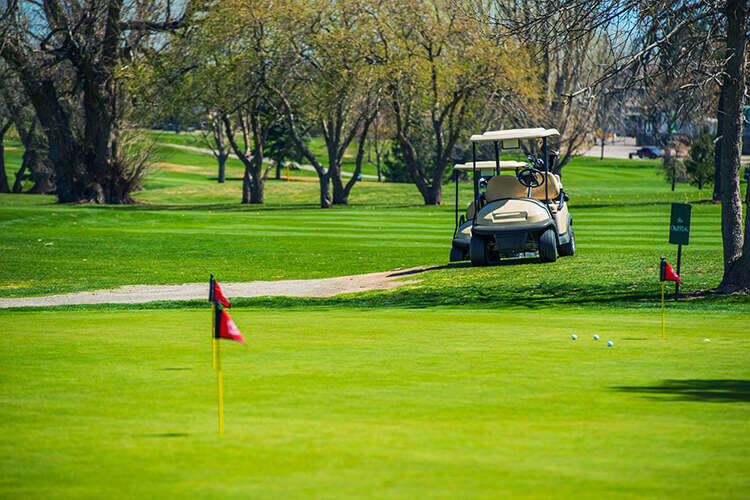 “I always thought our golf course had a links-style look to it,” said Misheff. “And when we decided that our bunkers needed work, I recalled a conversation I had with the architect, Keith Foster. He said that if he had it to do over again he wouldn’t have made such severe facing in the bunkers. One of those friends was former PGA Tour player and current golf commentator Gary McCord, who provided a lot of input. Not only did he give a thumbs-up to the sod wall idea, he also suggested shrinking some of the bunkers, and totally eliminating others. Wolfe and his PTI crew worked side-by-side with SunRidge golf course superintendent Ron Ruppert and his team. Ruppert and Wolfe actually worked together on the original construction of the golf course 20 years ago. The team also re-shaped some bunkers and filled in others, significantly cutting down on the total square footage of bunkers throughout the golf course. 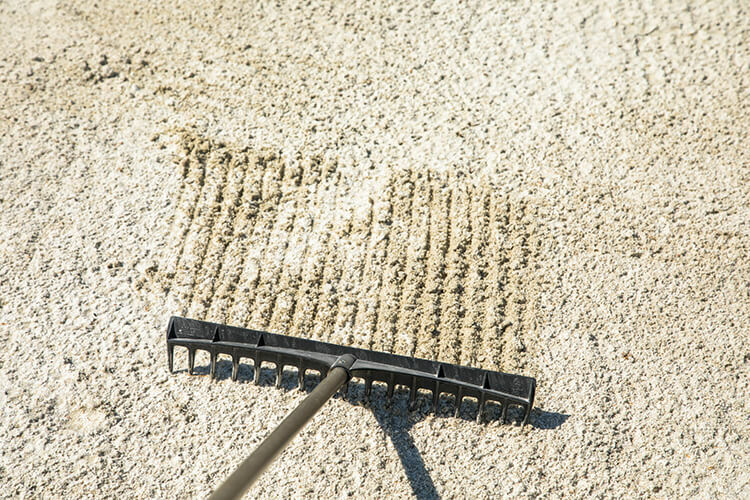 Sod-wall bunkers provide a viable, cost-saving solution to what is often a serious issue for desert golf courses, according to Wolfe. Misheff, and more importantly his golfers, are ecstatic with the results. With offices in Las Vegas, NV, Phoenix AZ and La Quinta, CA, Pro Turf International, Inc. is an innovative golf course maintenance, construction and renovation company that offers solutions to protect and improve the appearance, functionality, playability and value of our clients’ golf courses. 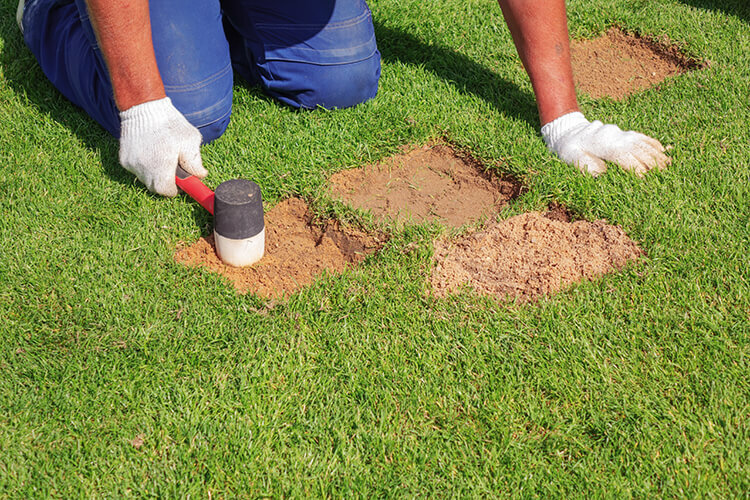 From complete turnkey daily golf course maintenance programs to bunker refurbishing to full-scale construction and renovation projects, Pro Turf International has the expertise to deliver on time and under budget. 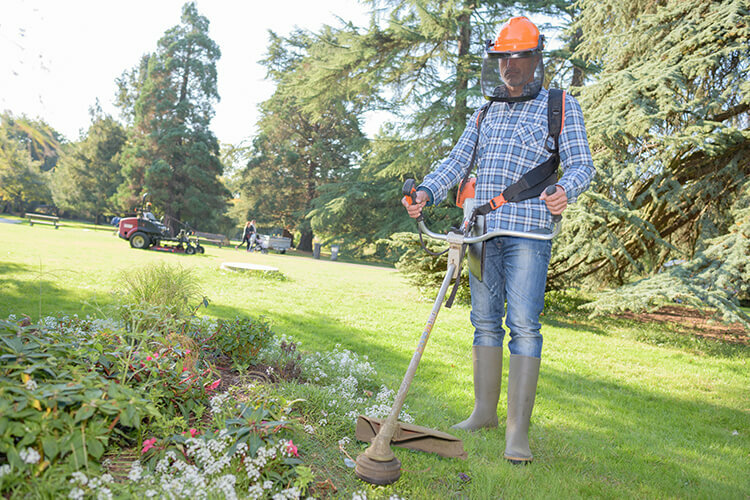 PTI has been improving golf courses, resort landscaping, park districts and sports facilities for over 25 years, with a team of industry professionals with over 75 years of collective industry experience to handle the most complex maintenance, construction and renovation projects – whatever the project scope. 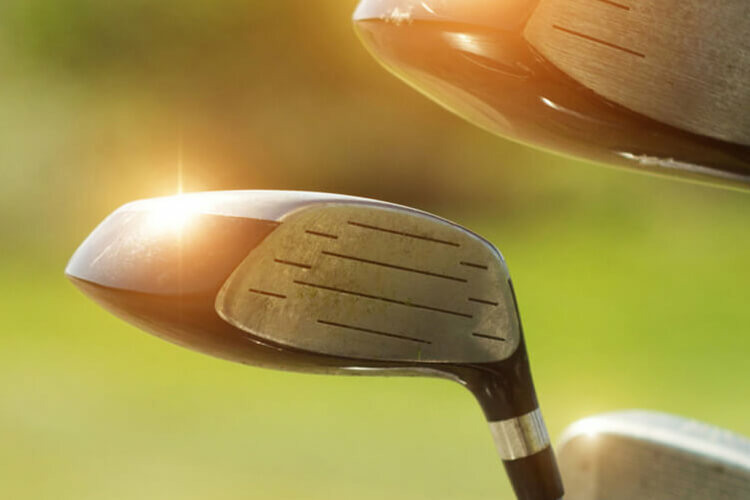 For more information, visit www.ptigolf.com, or call (702) 315-5121. SunRidge Canyon’s 6,823-yard, par-71, Keith Foster-designed golf course unfolds around the rugged ridges and shady canyons unique to the desert mountains that divide Fountain Hills from Scottsdale, Arizona. This golf coursegradually descends on the way out before doubling back to climb up the slope on the way in. This subtle elevation change lies at the heart of the dramatic golf experience at SunRidge Canyon. 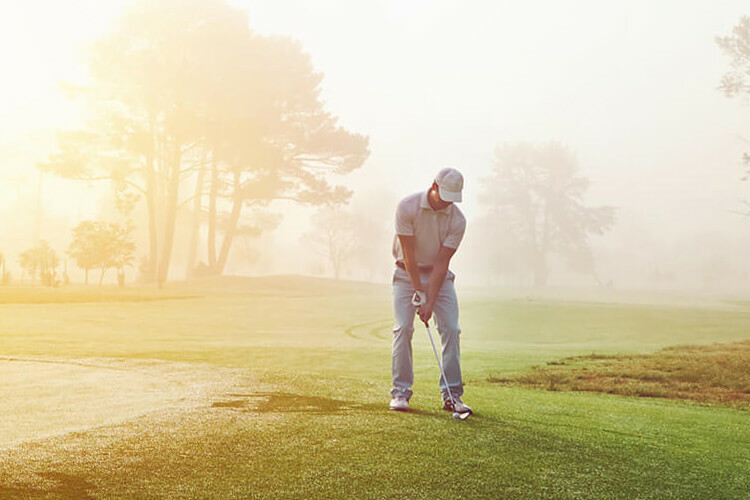 Golfers also discover that it wasn’t so much created by a bulldozer as it was carved out over eons by the relentless pressure of wind and water. Foster had the good sense to follow Mother Nature’s lead, and in the end, the beauty and challenge of SunRidge Canyon is unlike any other desert golf experience in the Valley of the Sun. The layout includes six outstanding finishing holes – two par 3s, par 4s and par 5s – known as the Wicked 6. SunRidge is also home to Hot Stix Golf club fitters and Mann Krafted Kustom Milled Putters.